Which was the best performer in emerging bond markets last year? The sector had a pretty torrid year overall, with sovereign dollar bonds finishing 2013 almost 7 percent in the red. But there were exceptions. The best returns were to be had – hold your breath — in little-watched Belize, a member of JPMorgan’s NEXGEM frontier debt index. Someone who bought Belize debt at the start of last year would have been in the money, with gains of 50 percent, though the returns were in fact down to the restructuring of Belize debt early last year. Second on the list was Argentina, despite court wranglings over hold-out funds from the country’s 2002 default. 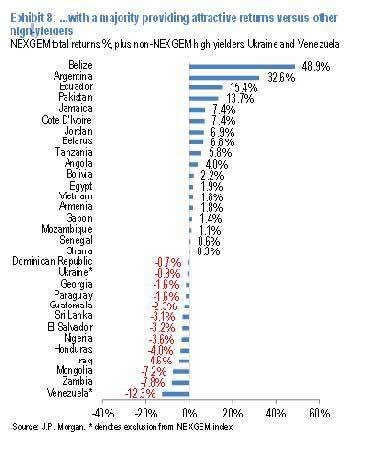 Just as frontier stocks outstripped emerging stocks in 2013 (Bulgaria was top dog in that index), the NEXGEM index as a whole outperformed emerging debt, enjoying returns of 5 percent last year. Interestingly, the top 10 also included Ecuador, Jamaica and Cote d’Ivoire, three other countries that have been in default in the recent past.